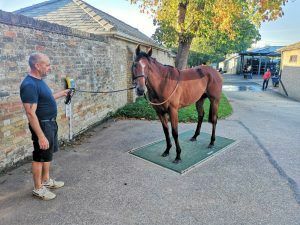 Horse Weigh > Uncategorised > The Breeders’ Cup victory for Enable & Frankie Dettori, becoming the first Prix de l’Arc de Triomphe winner to follow up with success at the Breeders’ Cup. Enable is back in training for the 2019 season! Enable is back in training for the 2019 season and feeling great according to trainer John Gosden. Will they go for the Arc hatric? We look forward to following this incredible horse and team through the 2019 season. Shortly following their victory at the Prix de L’Arc de Triomphe. Enable riden by Frankie Dettori has only run 3 times this season due to injury but took the victory, from four year old Irish challenger ‘Magical’, by less than a length. Trained by John Gosden for owner/breeder prince Khalid Abdullah, the double Arc winner won with Magical finishing just behind and Sadlers’ Joy third. Aidan O’Brien presented John Gosden the trophy to mark his third British trainers’ championship after taking 3 winners on British Champions Day at Ascot. Finishing the day winning the Champion Stakes on Saturday 20th with Frankie Dettori & Cracksman. Early in the day Frankie Dettori won the Group Two Long Distance Cup with Gosden’s outstanding stayer Stradivarius. Gosden’s third winning being the stunning Roaring Lion who won the Queen Elizabeth II Stakes with Oisin Murphy’s, his first win on championships day in 5 years. A fantastic race on Sunday 7th October 2018 gave Frankie Dettori, piloting odds-on favourite Enable, him victory for the 2nd year in a row at the Paris Longchamp. Winning Europe’s richest race, Enable is trained by the great John Gosden. Through injury, Enable had missed most of the current season but made an impressive comeback at Kempton last month. “It’s not been the preparation we wanted, it has been very difficult, and we had a hiccup between Kempton and here with a slight temperature thing, so it has not been easy,” trainer Gosden told ITV Racing. John Gosden believes regular weighing is an important part of these horses training. 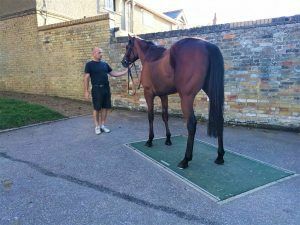 The Horse Weigh “Kentucky” platform is situated at John Gosden’s Clarehaven Stables, in easy reach of all the yards. Making this race even more special the 1:2 finish as James Doyle carved a path from the back of the field on the home straight to just finish short of winning on William Haggas’ Sea of Class. “We had to take our medicine from where we were drawn. Two more strides and she’d have won. She deserved to win. Next year.” said Doyle. “We’d have got her in another stride,” reflected Haggas. “It was a great effort and a close one to lose. She’s run a great race from the draw. It was a very brave decision of James’s to do what he did and it was a whisker away from coming off. I’m thrilled with him and I’m thrilled with the filly. 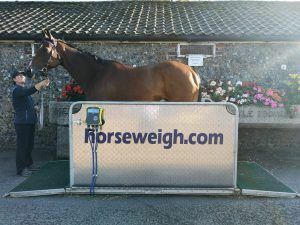 William has three of our weighing platforms at his stables, Somerville Lodge, Newmarket.